A theoretical framework is presented to explain how agents respond to information under uncertainty in contingent valuation surveys. Agents are provided with information signals and referendum prices as part of the elicitation process. Agents use Bayesian updating to revise prior distributions. An information prompt is presented to reduce hypothetical bias. However, we show the interaction between anchoring and the information prompt creates a systematic bias in willingness to pay. We test our hypotheses in an experimental setting where agents are asked to make a hypothetical, voluntary contribution to a public good. Experimental results are consistent with the model. Aadland, David M., Arthur J. Caplan, and Owen R. Phillips. 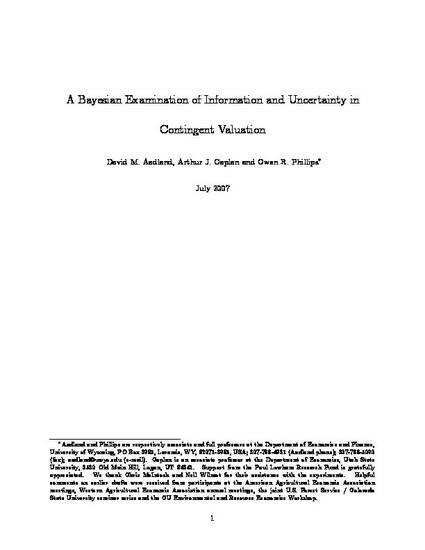 (2007) "A Bayesian Examination of Information and Uncertainty in Contingent Valuation." Journal of Risk and Uncertainty, 35(2), 149-178.